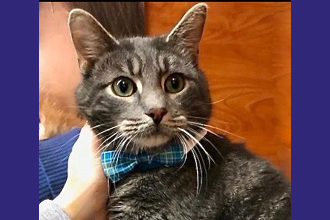 Jan. 16, 2019: Handsome Michael is a two-year-old blue, gray, and silver domestic shorthair kitty with sparkling green eyes and a gorgeous tabby coat. Michael was rescued from a local shelter and has proven to be a real sweetheart. Everyone who meets him falls in love and he is a favorite amongst the volunteers. Michael knows his name and will come when he is called. 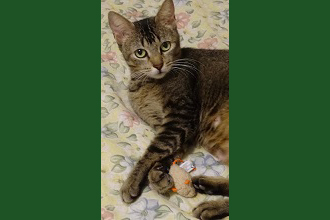 He is gregarious, affectionate, and well-mannered and gets along with kids, dogs, and other cats. He is also fully litter-box trained. Michael is the kind of cat who will steal your heart and never let it go. He is healthy, neutered, and up to date with his vaccinations. For more information, please email CLOAKING . If you would like to meet Michael, please visit www.Poshpetsrescue.org or fill out an application at https://poshpetsrescueny.org/cat-application/.